I set out to be brave last year. I waffle back and forth in my opinion of how well I actually lived it out. But there are moments when I find it easy to recognize the small acts of personal bravery that marked my journey through 2014. I opened my heart to possibilities. I allowed myself to enjoy the present without needing to know where things may (or may not) lead. I let my guard down and let others in. I used my words more — like when I wrote about depression and suicide, even when it terrified me. I leaned into relationships and established healthier boundaries. I faced a devastating loss and didn't fall apart like I once thought I would. I started going to church again. From the outside looking in, I'm sure my life didn't look very brave to others. But from the inside looking out, I see it: 2014 demanded courage of me. Let's be honest though. The year didn't end with me arriving at some grand finish line with an "I am brave" medal hanging around my neck. But I never really expected it to. That wasn't the point. The year did, however, end with me feeling more confident that I am becoming brave. And, when I force myself to remember the truth, I know that the process of becoming is far more valuable than the arrival at being. I hear Sara Bareilles in my head: Show me how big your brave is. And my brave is bigger this January 1st than it was last January 1st. Shoot, my brave is bigger today than it was yesterday. And that, friends, is all that matters, isn't it? It's the best any of us can do really. My last brave step of the year was choosing my one word for 2015: Wholehearted. I'm determining to live more wholeheartedly. To be all-in. To be fully present. I'm committing to give myself permission (and a nudge) to be truly myself. To stick to my guns. To live, write, and speak with integrity (in the fullest sense of the word — with wholeness and completeness in all parts of me). I'm purposing to show up this year, in every way. In each situation, in each decision, and with every single person, I want to show up wholeheartedly. Even when that means facing my fears. Or candidly sharing the vulnerabilities of my heart. Or taking a huge risk. Even when that means flying solo. Or saying no. Or standing my ground when I want to run away. It's a good thing I developed some extra bravery. This wholehearted business is daunting. When I'm falling short and feeling like a big hot mess of a failure, do me a favor. Remind me to extend myself grace, and to focus on the journey rather than the destination. 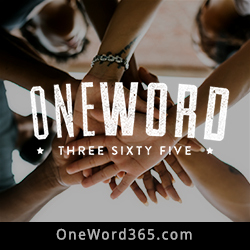 What word do you want to guide you through 2015? Originally posted at A Life Overseas.